A bio huh? Well, my real name is Luke Brickley, but everyone either calls me Sketch or Minnesota Menace. I have been called Sketch since high school, not to be confused with other artists who may claim to be the "original". 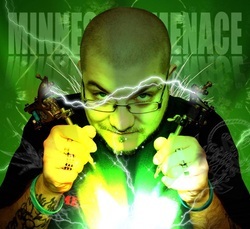 Minnesota Menace is a musical moniker and also my signature name for anything artistic I am currently doing. I like to think I am fairly versatile in most styles, but my favorites are black and grey and new school/inkbomb. I like designing custom pieces that think outside the box. I have had a fairly old school upbringing so I tend to stick to my coil machines and tried and tested colors. I don't do UV, Gang, Hate or face tattoos, so if that is what you are looking for, please ask someone else to ruin your life. I tend to cover a lot of old mistakes, and generally have a good time doing so. Covering old gang tattoos is my favorite as I feel like I am helping someone take a step in the right direction with their lives. Cover-ups are a challenge that for the most part I welcome. What can I fix for you. "Body and the mind inscribed on the soul. Needles to the flesh so the feelings show. Pain is the essence, but not what you think. We claim a right of passage when we getting some ink"
-from "INK" via "Wreckin' Krew - 10" album. Find what days Luke is at the shop by clicking here! Luke accepts cash AND credit cards!